Is it worth the money or is it just a lot of BS? There is no escaping Kim Kardashian on television and social media. There has been so much hype about her KKW X Mario Palette that I decided to order it and find out for myself what the fuss is all about. With a $45.00 price tag plus tax and shipping coming out to about $57.00, I wanted to see if it was worth the money. Even though I am a bit tired of seeing Kim everywhere, I really did fall in love with this eyeshadow palette. Yes, the packaging is terribly boring–gray cardboard without a brush or applicator inside. However, it does have a large mirror and that, at least, is helpful. What I like about is what’s inside. These colorful shadows are easy to work with and go a long way with their pigmentation. I experienced very little fall out and the colors were easily blendable. I think their application and formula are awesome! It was a lot of fun using their different shades. It made me feel pretty when I put it on. The colors in the KKW x Mario eyeshadow palette are just gorgeous. The shades picked are ones used by Mario on Kim for some of his most memorable shoots with her over the past decade, so there’s a definite editorial color scheme. The matte shades and Vegas & Libra need a lot of building, but do reach the pan-shade eventually. Mario says in their promo that the mattes and deeper/brighter shades are formulated to need building, as he knew that most of Kim’s fans are younger and might be overwhelmed by majorly pigmented colors. I understand why some people would not want to bother with shadows that need building up, but that is truly how they are meant to be. My favorite colors are the rich and creamy Miami, the metallic Armenian and beautiful Bronzy, although I think they are all gorgeous. Because I am a woman of a certain age, I will pass on wearing the bright blue eyeshadow until I go to the Def Leppard Concert this Fall in California. At that point, I may be feeling a little more adventurous with my make up! The verdict after testing? 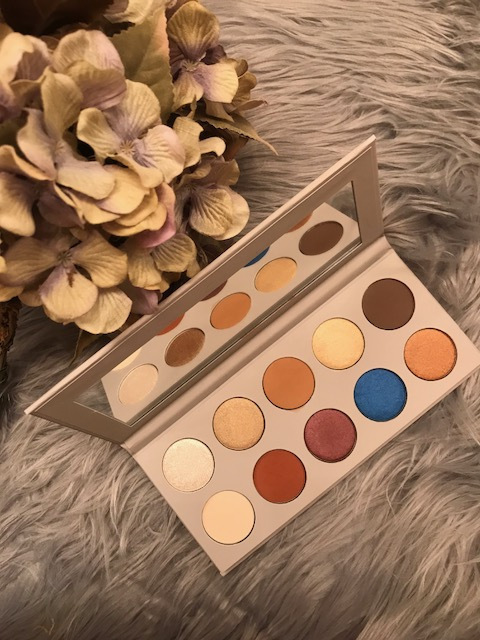 I like this palette very much but I think the price point (with tax and shipping mine came to $57.00–don’t tell my husband) is on the high side. However, if you feel like treating yourself to a high-quality eyeshadow palette, then choose this one. You do get a lot of eyeshadow for the money. Plus, it’s truly fun to experiment with and the shades do wear very well with a lot of staying power. Since it arrived in the mail, I have been wearing these eyeshadows quite frequently. Because the main colors are neutral, they go with every outfit. I am satisfied with my purchase. To order, visit Kim’s website because if you order it anywhere else you risk getting a counterfeit product like I did before I got the real one! 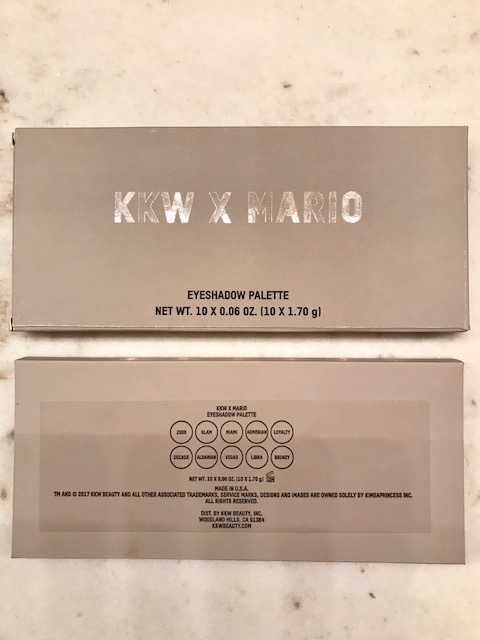 Visit https://kkwbeauty.com/products/kkw-x-mario-10-pan-eyeshadow-palette. Let me know what you think. Are you a Kardashian fan? Would you buy her make up? Do you already have her palette? Send me your comments below or at cwris@yahoo.com. Coming up: A review on a fabulous K-Beauty Cranberry Mask, my experience with at-home teeth- whitening service Smile Brilliant, and a book review. Stay tuned! You took some really amazing photos for this one! Im very impressed! Thank you Lauren. You’re a peach!